Pittsburgh, PA – Once again the state of Pennsylvania no only qualified the most wrestlers to the NCAA Tournament – but the Keystone State leads the Nation with 16 total All-Americans. The next closest state was New Jersey with 10 All-Americans. Five wrestlers from Pennsylvania fell in the blood-round, one win shy of an All-American finish, including a match between two Pennsylvania wrestlers at 184 pounds. Included in the 16 All-Americans will be three National finalists – Spencer Lee (125), Jason Nolf (157), Vincenzo Joseph (165) – all three looking to be multiple time National Champions. 125 – Jack Mueller (Virginia) dec. Sebastian Rivera (Northwestern), 8-2. 125 – Spencer Lee (Iowa) dec. Nick Piccininni (Oklahoma State), 11-4. 133 – Daton Fix (Oklahoma State) dec. Luke Pletcher (Ohio State), 4-2. 133 – Nick Suriano (Rutgers) dec. Stevan Micic (Michigan), 4-1. 141 – Yianni Diakomihalis (Cornell) dec. Jaydin Eierman (Missouri), 6-5. 141 – Joseph McKenna (Ohio State) dec. Nick Lee (Penn State), 4-3. 149 – Anthony Ashnault (Rutgers) dec. Matthew Kolodzik (Princeton), 2-0. 149 – Micah Jordan (Ohio State) dec. Austin O’Connor (North Carolina), 7-4. 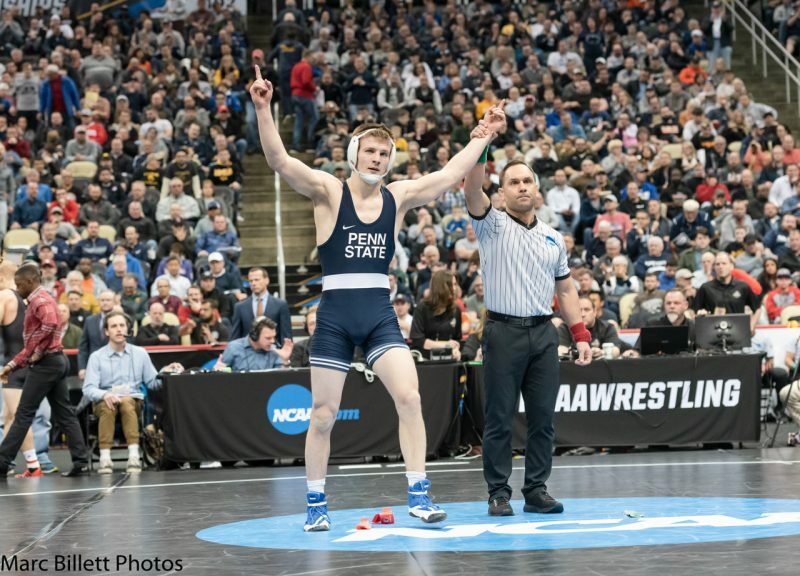 157 – Jason Nolf (Penn State) dec. Hayden Hidlay (N.C. State), 3-2. 157 – Tyler Berger (Nebraska) dec. Kaleb Young (Iowa), 5-3. 165 – Mekhi Lewis (Virginia Tech) dec. Evan Wick (Wisconsin), 5-2. 165 – Vincenzo Joseph (Penn State) dec. Joshua Shields (Arizona State), 3-2. 174 – Mark Hall (Penn State) dec. Myles Amine (Michigan), 2-1 TB2. 174 – Zahid Valencia (Arizona State) major dec. Daniel Lewis (Missouri), 11-3. 184 – Maxwell Dean (Cornell) dec. Myles Martin (Ohio State), 5-4. 184 – Drew Foster (Northern Iowa) dec. Chip Ness (North Carolina), 7-4. 197 – Bo Nickal (Penn State) pinned Pat Brucki (Princeton), 4:40. 197 – Kollin Moore (Ohio State) major dec. Preston Weigel (Oklahoma State), 12-4. 285 – Derek White (Oklahoma State) dec. Jordan Wood (Lehigh), 3-1 SV. 285 – Anthony Cassar (Penn State) dec. Gable Steveson (Minnesota), 4-3. 125 – No. 4 Jack Mueller (Virginia) vs. No. 3 Spencer Lee (Iowa). 133 – No. 1 Daton Fix (Oklahoma State) vs. No. 3 Nick Suriano (Rutgers). 141 – No. 1 Yianni Diakomihalis (Cornell) vs. No. 2 Joseph McKenna (Ohio State). 149 – No. 1 Anthony Ashnault (Rutgers) vs. No. 2 Micah Jordan (Ohio State). 157 – No. 1 Jason Nolf (Penn State) vs. No. 2 Tyler Berger (Nebraska). 165 – No. 8 Mekhi Lewis (Virginia Tech) vs. No. 2 Vincenzo Joseph (Penn State). 174 – No. 1 Mark Hall (Penn State) vs. No. 3 Zahid Valencia (Arizona State). 184 – No. 5 Maxwell Dean (Cornell) vs. No. 6 Drew Foster (Northern Iowa). 197 – No. 1 Bo Nickal (Penn State) vs. No. 2 Kollin Moore (Ohio State). 285 – No. 1 Derek White (Oklahoma State) vs. No. 2 Anthony Cassar (Penn State).